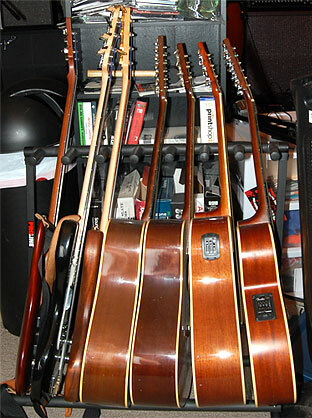 I have over 71 guitars (this includes Basses and Acoustics). 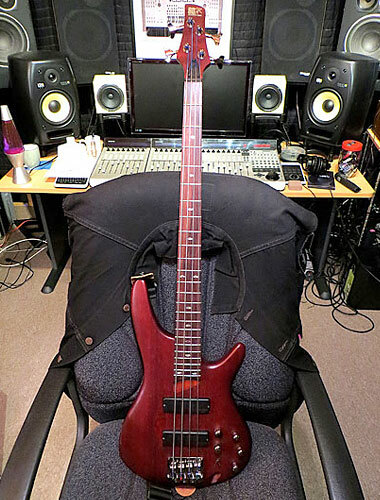 In the middle to late 90s, when Wurlitzer's music store when out of business, I bought 2 Parker Fly Deluxe guitars (customized with GK2A midi pickups for my Axon guitar synth and Yamaha Motif rack XS to go along with the magnetic and piezo pickups already on there) that led to me buying and customizing a Parker P-36 Tele Style guitar with Chris Kinman 48 Broadcaster Tele pickups in them (I also had nitro cellulose sprayed on the back of the neck by Rick LeGault for a vintage feel); a Parker PM20 Les Paul style guitar with a mahogany body and a figured Bubinga top with Virtual PAF pickup; a Parker P-30 Strat style guitar - antique creme with a pearlized pickguard and Chris Kinman Woodstock plus pickups installed; from there I branched out and bought and customized an Ibanez Artcore AF75TGD guitars with gold hardware (one in Candy Apple Red and one in Piano gloss black) that I had Noll Guitars “Getschify” (my term for turning Ibanez Artcore hollow body guitars into Gretsch guitars) for me (gold Gretsch knobs, volume knob on the lower bout, selector on the upper bout, the original selector turned into a kill switch, and TV Jones “TV Classic” pickups in the Candy Apple Red guitar and TV Jones Magnatron (like the DeArmond single coils in the Duo Jet) in the Black one; An early seventies Univox “Gimme” Les Paul (identical to the one I owned in 1976) that Jim at Noll guitars restored for me. 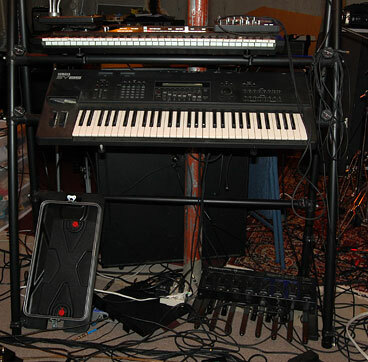 He also installed a Graph tech Ghost system for piezo acoustic sound and midi guitar synth output. 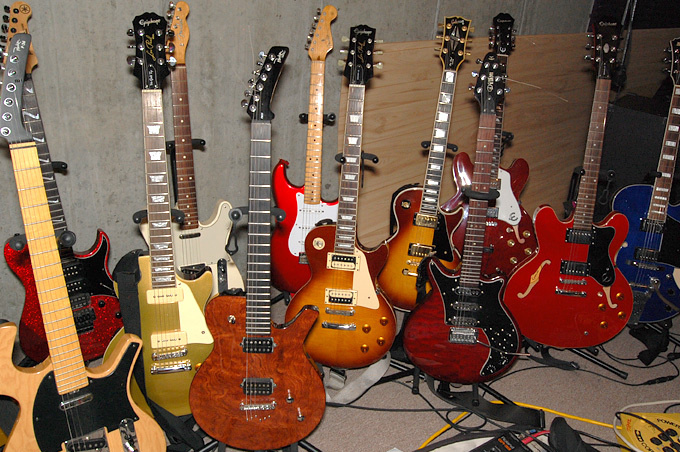 As of 2011 the lineup of main guitars has changed. 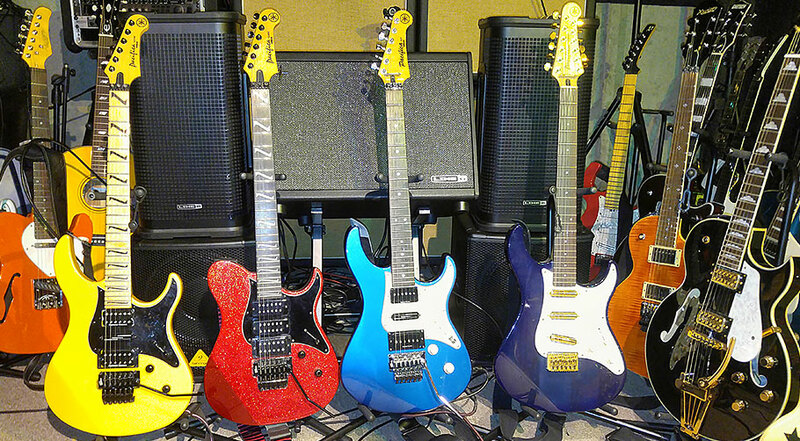 All of them have been modified with Graphtech Ghost MIDI pickups and have been either painted, had neck reshaped or both by Jim at Noll Guitars. 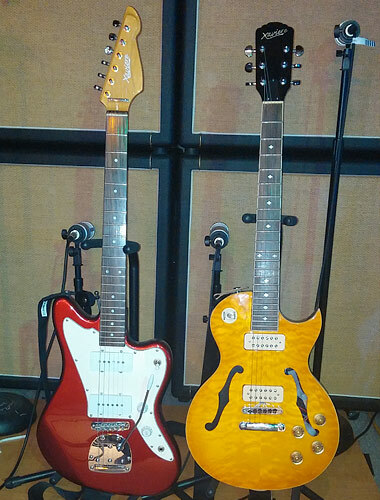 They are: A 70s Univox “Ripper” Strat copy guitar, that Jim at Noll also restored. Jim repainted it white (bright inkjet paper white), potted the pickups, installed the Ghost pickup system and reshaped (to match my Parker P-30), refinished and refretted the neck. 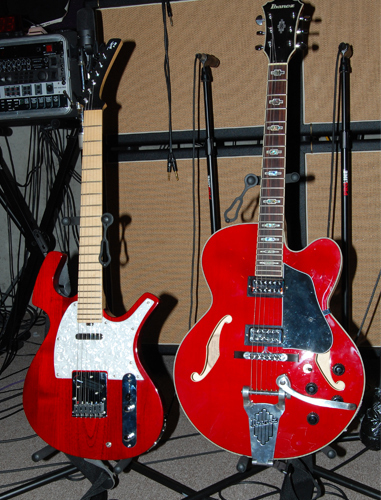 A mid 70s Univox Deluxe Les Paul and a Parker P-30 that Jim painted Cherry Life Saver Red (my color idea, I told Jim that I wanted it to look like a Cherry Lifesaver, not Candy Apple Red), sprayed the neck with a nice gloss finish and added a Ghost pickup system to it. 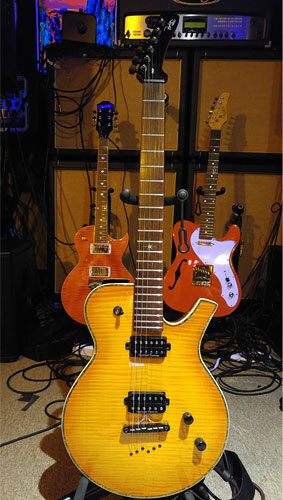 It has a pearlized pickguard, maple neck and Gold Lace Sensors in the neck and middle and a Dimarzio Fast Track in the bridge position; A guitar that Noll Built for me from an Aria Pro II maple neck that I had. 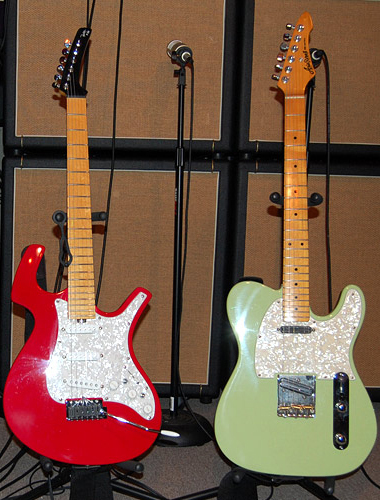 They added a tropical green Tele body, GFS Lil Puncher pickups and a Pearlized pickgaurd; a wine colored Epiphone Casino that Noll added a Bigsby Tailpiece and had Lindy Frailin install his noiseless P-90s in the Epiphone chrome covers. 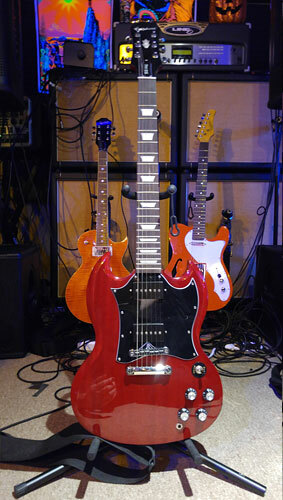 A Red Parker P-36 Tele style guitar with a Dimarzio Area-T in the neck and a Fast Track-T in the bridge, along with a Ghost system for MIDI. Jim put a nice glossy finish on the neck. 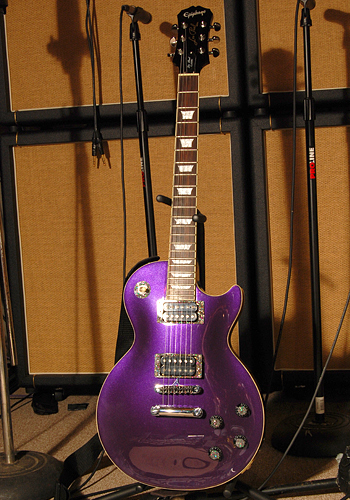 An Epiphone Les Paul Classic (that used to be translucent black) that Jim painted Purple Metallic for me and put on custom glitter knobs, selector ring and pickup rings. 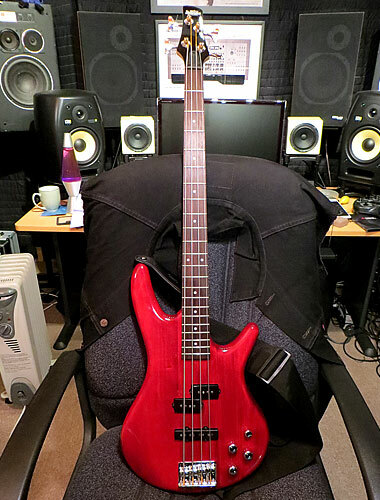 I also have a new Red Artcore that Jim installed TV Jones TV Classic pickups and a Ghost MIDI system in for me. 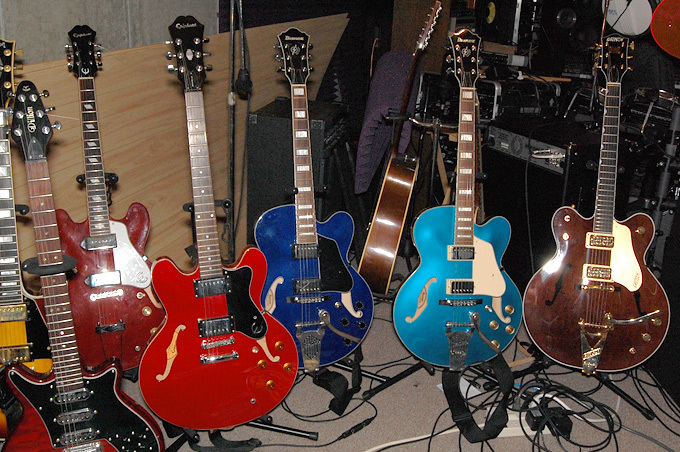 It's great for clean Beatles type stuff, Jazz, Blues and has a great raw rock sound. 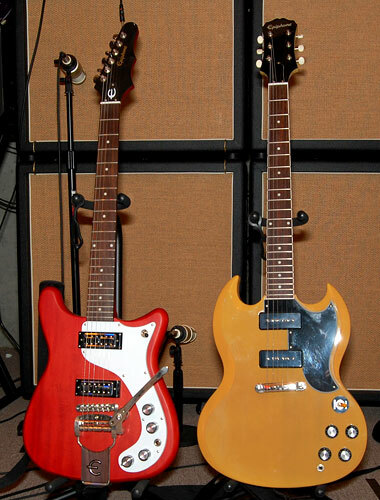 Very Pete Townshend (Pete used a Grestch with filtertron pickups on Who's next and Quadraphenia). Jim at Noll is an artistic genius and a highly skilled craftsman who, besides buffing and fixing some dings on my 70s Univox “Gimme” Les Paul, restored a badly damage headstock and hand painted part of the logo that was damaged and you can not tell that it was ever damaged. 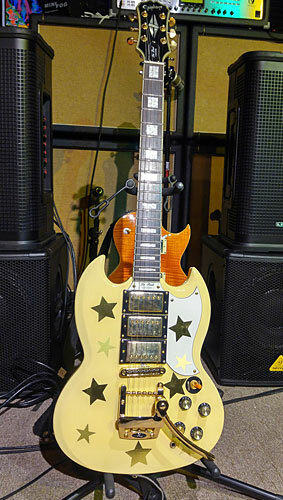 It looks just like the one I owned, in the 1970s, the day it came out of the music store. He has matched and reshaped necks for me. He has painted bodies and refinished necks for me. The work always came out better than new. I can’t say enough about his work. He is the best, period. Stan (with his knowledge of history and his great stories) does great pickup installation, wiring and setup (we’ve know each other for quite a long time). Steve is great too. He does pickup installation, wiring and setup. And, of course, Ralph is there to help you with anything that you need. 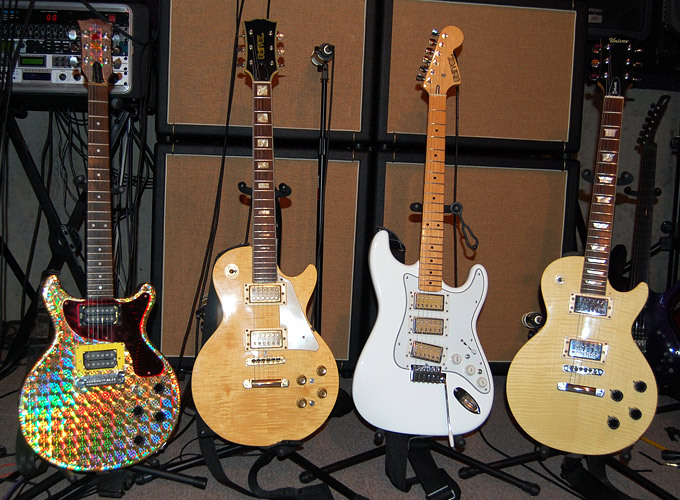 If you need any work done on your guitars, especially your vintage babies, these are the guys to go to. I can’t say enough about them and I highly recommend them. 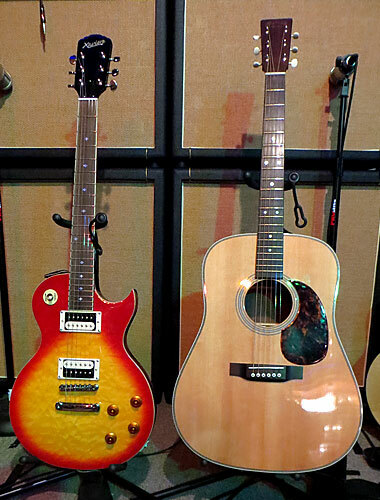 My other favorite guitars that I use most for recording, rehearsing and performing are: a 1972 Gibson Les Paul Custom, an Epiphone honeyburst Les Paul Standard with Virtual PAFs, a Fender 60s Tele with Kinman 60s Telecaster pickups, an eighties Japanese reissue 1957 Fender Stratocaster (Candy Apple Red) with Seymour Duncan Vintage Rails and a GFS Lil Killer in the bridge position, an Epiphone cherry red Dot (ES335), an Epiphone G-400 Custom (Three pickup Les Paul/SG Custom), an Epiphone ‘66 G-400 SG with Seymour Duncan Phat Cat Humbucker size retrofit P-90 pickups, an Epiphone Limited Edition G-400 “Goldtop“ SG and an Epiphone ‘56 Goldtop Les Paul with P-90s, an ebony Epiphone Classic Les Paul, a Gibson SG Junior and a Gibson Violet Burst SG Goddess, Three different early 90s Yamaha Pacifica guitars (Royal Blue 921 with lace sensors and an Virtual PAF bridge humbucker , Yellow 1221M with a Virtual PAF neck-a class of 55 middle- and a Virtual PAF bridge pickup, and a Red Glitter 1230S with two Q100 P-90 style pickups and a Virtual PAF bridge humbucker), A White Brian May Signature Guitar and a Dillion Brian May Guitar with three Burns Tri-Sonic Pickups, two Ibanez Artcore AFS75T guitars (an electric blue with stock pickups and a turquoise one that Noll installed TV Jones version of the Gretsch HiLo’tron pickups in it and added a volume to the lower bout to make it sound and play like a Gretsch Tennessean) and a Gretsch reissue of the 6122 called The Country Classic (the guitar that George Harrison used on The Ed Sullivan Show in Feb. of 1964). 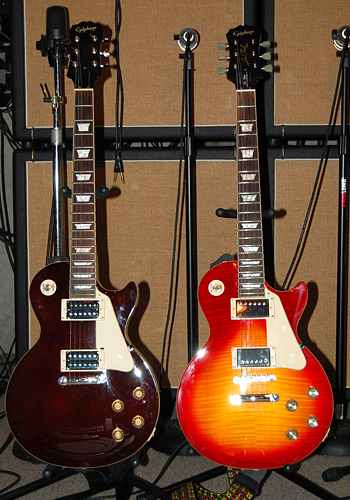 An Epiphone 1954 Oxblood Les Paul (Jeff Beck Model), an Epiphone 50th Anniversary 61 SG and an Epiphone 50th anniversary 1960 ltd. edition Les Paul. 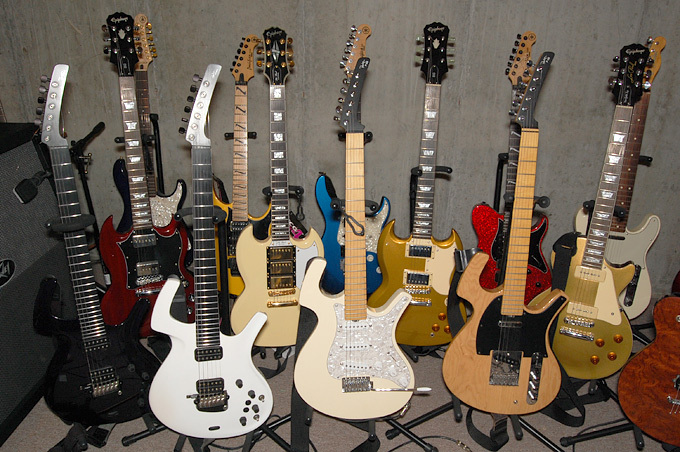 In late 2012, I started using Xaviere guitars and they have become some of my favorites. 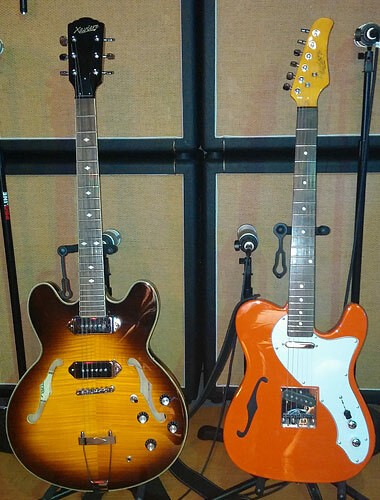 I can't believe the quality and playability vs price. 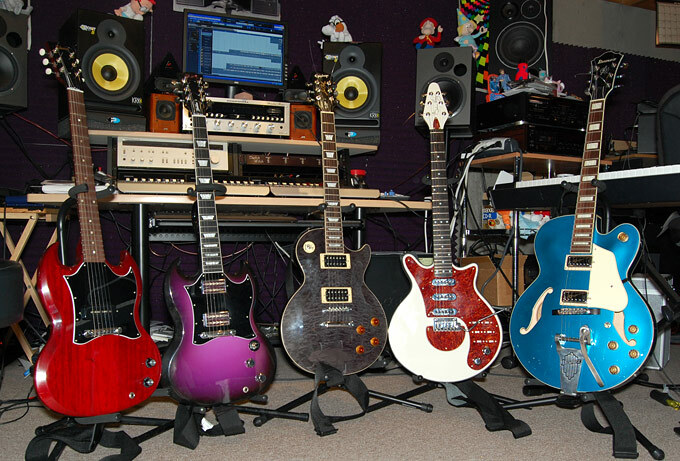 These guitars ROCK! 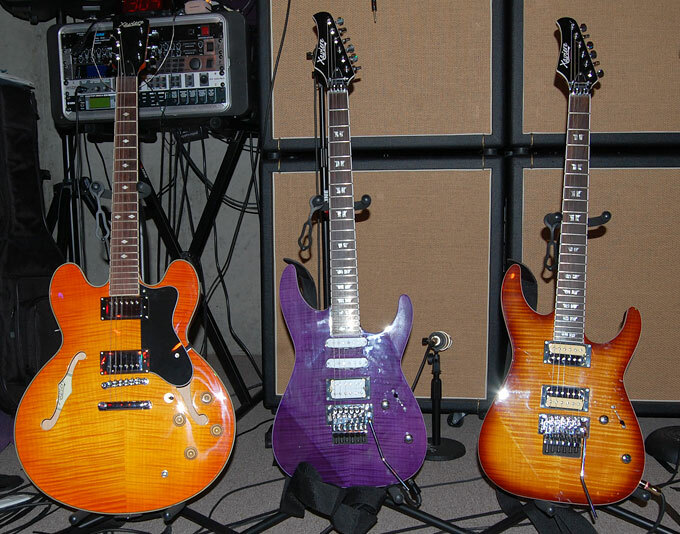 These include my Orange XV-555, with Seymour Duncan Whole Lotta Humbuckers and Ghost loaded Floyd Rose with Stone Tone granite block and my amber XV-900 (ES-335 style), in which I had Mississippi Queen P-90 pickups installed (these, along with my Cherry Sunburst and Honeyburst Epiphone Les Paul Standard Plus Top Pros, have become some of my favorite guitars) and the XV-890 HSS, in purple (amazing build quality...total shred machine, but beautiful feel and looks), with a Dimarzio Mo' Joe Humbucker in the bridge, two Satch Track pickups and a Ghost Loaded Floyd Rose installed by Jim at Noll. 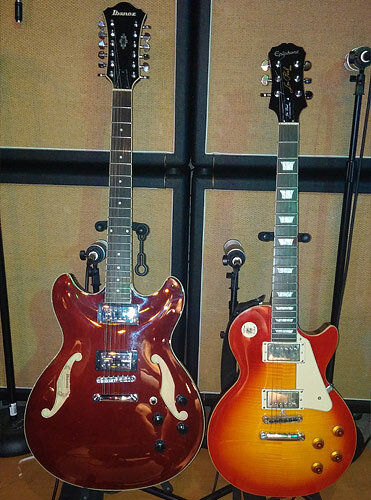 I also own an XV-890 dual humbucker in sunburst, and a Cherryburst XV-510 Carved Top Quilted maple (Les Paul style), an XV-560 ( hollow body Les Paul with F holes), with TV Jones Magnatron, TV Classic pickups and Ghost System, an XV-910 (Casino type guitar), an orange XV-620 (Tele style hollow body) with hot pickups and Ghost Loaded bridge and a candy apple red JT-100 (Jazzmaster style guitar) with hot pickups. 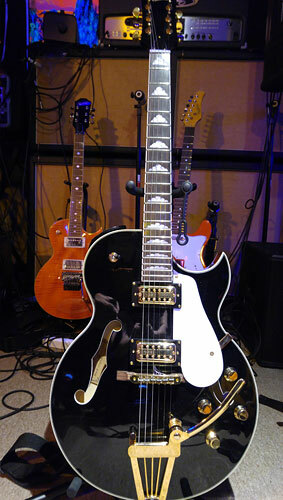 I also use an Epiphone 1966 reissue Wilshire, in which I had MOJO Tone Johnny Winter Signature pickups installed. My very good friend and student, Jon, bought me a Martin Custom acoustic guitar. 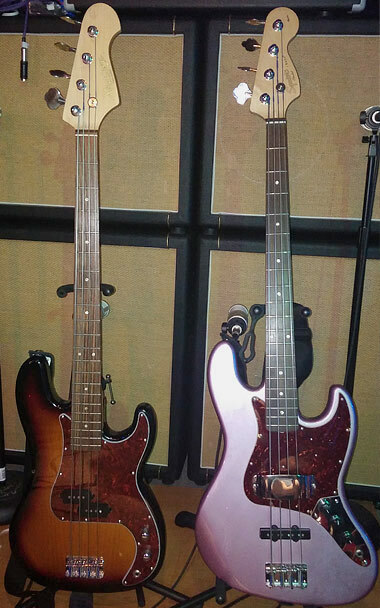 He put in a bone bridge, bone pins, upgraded pickguard and adjusted the action for me. This is now my go to acoustic. 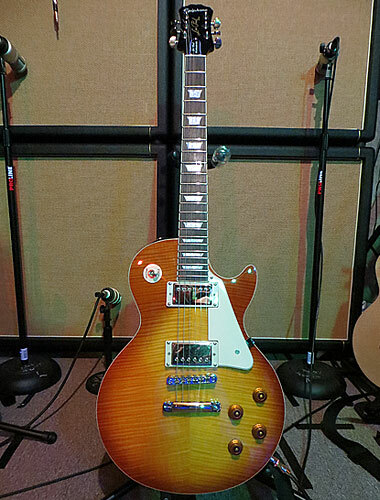 Epiphone Classic Les Paul. Custom purple paint job, glitter knobs, glitter pickup rings, glitter pickup selector ring, Ghost MIDI System and electronics (vintage style caps and pots) by Jim at Noll guitars. 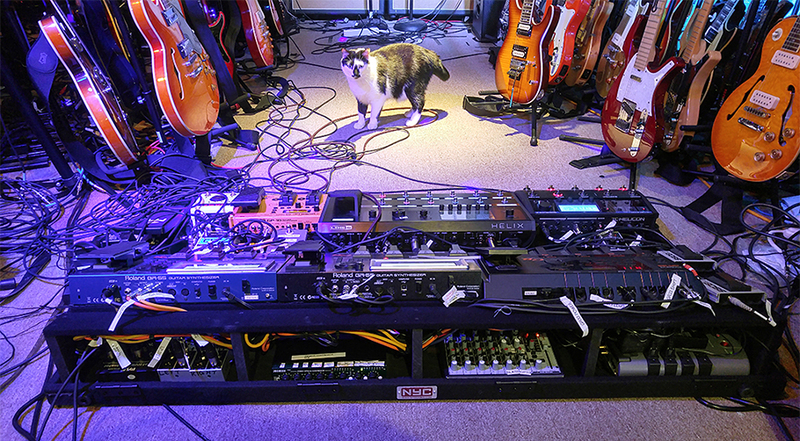 In mid 2014 I had a new pedalboard made for me by Mike at NYC Pedalboards. It wa a great board, but because of the size (over five feet long with 2 tiers), materials and gear on the board, it weighed a ton. 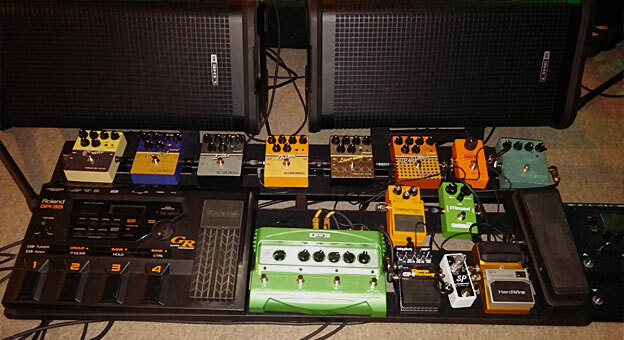 I just (August 2015) purchased two boards from Daniel at LYT Pedalboards. Theses things are thin and practially weightless (before adding gear). By splitting up the pedalboard and using the LYT boards, I don't fear gigging now. My signal goes into a Love Pedal line driver (before my wah, but after my treble booster so that the line driver doesn't interfere with the treble booster loading my pickups) into a pedal Racks true bypass switch with eight loops (Either directly or using a Line6 wireless). Loop 1- A Fryer Brian May Treble Booster Plus (I ordered another three switch bypass switch so that I can add my Fryer Brian May Touring Treble Booster as well...Greg is building a Deluxe booster for me that will either replace something or be added...Greg is a GREAT guy and builds the most diverse and toneful treble boosters available); Loop2- a Crybaby Classic Wah Wah pedal with the Fasal inductor (for recording I also use a Geoffrey Teese Wheels of Fire Wah-Wah pedal); Loop 3- a Pro Analog MkIII Fuzztone (a recreation of the Sola Sound Tonebender that Page used on the first two Zeppelin albums); Loop 4- a Fulltone 69 Pedal (a recreation of the Roger Mayer modified Dallas Arbiter Fuzz Face that Jimi Hendrix used); Loop 5- a Line 6 distortion modeler, Ibanez Steve Vai Distortion Pedal and an EH C9 pedal and/or a JHS Superbolt Pedal; Loop 6- a Celestial Aquarius Fuzz, which I absolutely LOVE (this replaced my Electro-Harmonix Little Big Muff and American Woman pedals); Loop 7- An EH Nano Clone into an EH Nano Small Stone into an EH Nano Electric Mistress, with the small stone on and the option to turn the others on and off at will (these replaced my Foxx Foot Phaser Pedal); Loop 8- a Digitech Talker Vocoder; out of the true bypass into a Line 6 Vetta HD 300 watt Head (upgraded to Vetta II 2.5), on top of two AB Custom (made by Jesus from AB Custom Audio in California - all four cabs have white piping around the grille cloth and gold piping on the black bronco covering) open back 2x12 cabs loaded with four Line 6 Celestion G12H-90 speakers , sitting on top of two AB Custom 4x12 cabinets (Bronco Black with Wheat grill cloth) loaded with 4 Eminence Patriot Screaming Eagles (left Cabinet) and 4 Eminence Red Coat Wizards (Right Cabinet) so that one amp model (lets say a Fender 1953 tweed deluxe) comes out of the left 2x12 open back cab with the Celestions and the left 4x12 cab with the Screaming Eagles in it (giving a definite American vibe); and the other amp model (Let's say a 1969 Marshall Plexi with a Variax on it) comes out of the right 2x12 open back cab with the Celestions and the right 4x12 cab with the Wizards in it in it (giving it a British Classic Rock Vibe). 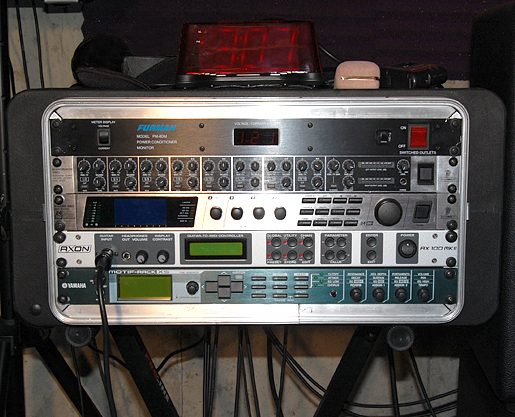 My Parker Fly piezo pickups and Graph Tech piezo pickups, Roland GR-55 guitar synth, Boss Gp-10, Axon MkII guitar synth triggering my Yamaha Motif Rack XS, effects from the Vetta, effects from my rack (Behringer V-Verb Pro running at 96K) go into a Behringer Eurorack line mixer and that goes into two Electro-Voice ZLX-12P powered PA Speakers (which are on stands about five and a half feet in the air on the extreme left and right of the 4x12 guitar speaker cabinets). 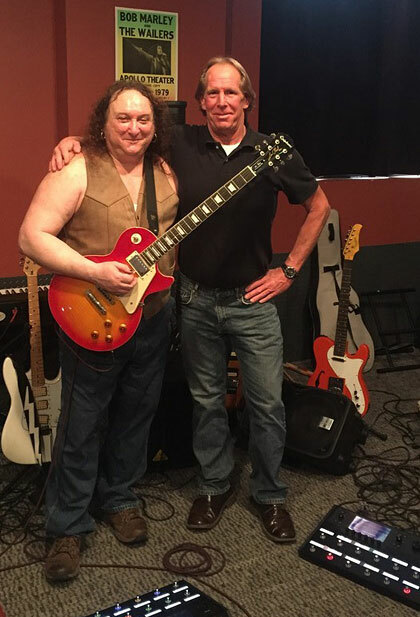 Mark and Sr. Director of Operations at Line 6, Frank Ritchotte (a good friend and a great human being). 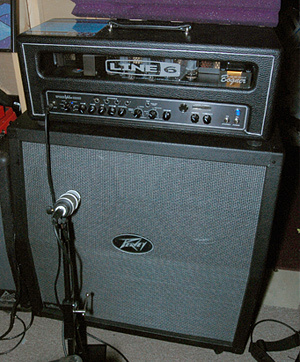 This is my new rig built around the Line 6 Helix. 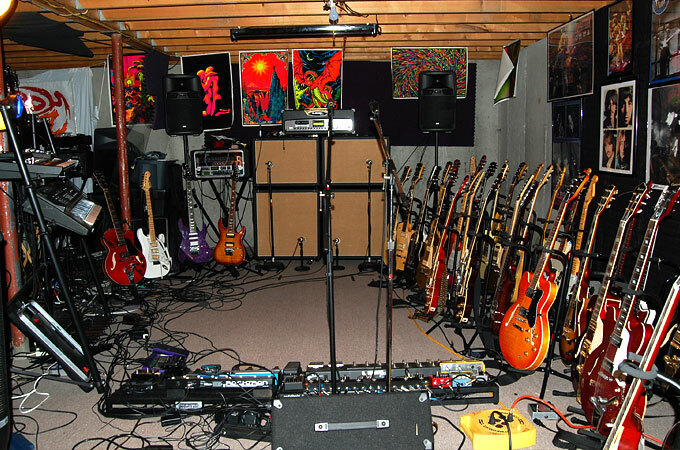 I have been using Line 6 gear since 2000, and Vetta since 2002. In June of 2015, while on vacation in Cape Cod, I read a blurb about the "coming soon" Line 6 Helix. I did some research, saw some videos and found the Helix thread on THE GEAR PAGE. I have been living on TGP ever since. I pre-ordered Helix in late June/early July and received my Helix in October of 2015. I still check in to TGP everyday, even though I own Helix. The people on TGP are very nice and everyone tries to help each other (rare on forums these days). Line 6 has the team that developed Helix on the thread all the time. They have been really great at listening and relating to their customers. There is a lot of info there on Helix (best ways to get what you want and news on updates). There have been updates that included features based on the things that customers requested on the thread. They really listen. The Helix is the most amazing and symbiotic guitar amp rig simulator-multi fx-signal router-piece of gear for live and recording...ever! I never thought that I would switch to ANYTHING from my Vetta rig, but this thing sounds and "feels" like a real tube guitar amp. 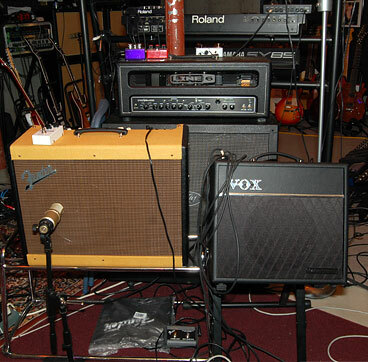 You get all the response and feel of playing your guitar into a real tube amp and, after going through virtual pedals, compressors, eq, delays, reverbs...whatever..., it comes out sounding like the best recorded amp you've ever heard. I could go on forever about this piece of gear, and not cover everything, so I'll get to the rig. Helix is the true successor to Vetta. Go to the Equipment Demo part of this page and watch the Vetta vs Helix demo to hear the difference. OK. This rig is pretty simple. I have my Greg Fryer hand built Deluxe Treble Booster on my board (NYC PEDALBOARD) and I have a Vocoder going into the effects loop of the Helix (as soon as Line 6 adds a Vocoder to Helix, in a firmware update, that will be removed). As far as guitar signal...that's it! 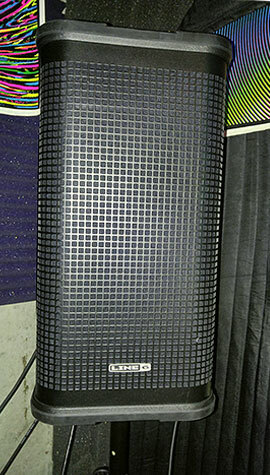 From the Helix, I go out of the L6 Link output (Line 6 digital output) to the L6 link input on the left Line 6 L2t powered speaker. Out of the L6 Link output of the L2t to the L6 Link input on the right L2t. 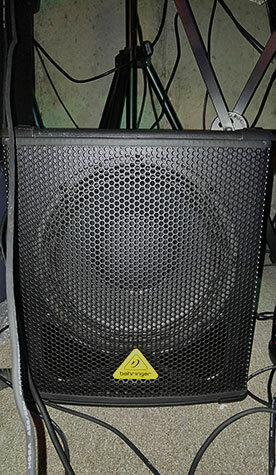 The L2ts are connected to two Behringer 12" subwoofers. 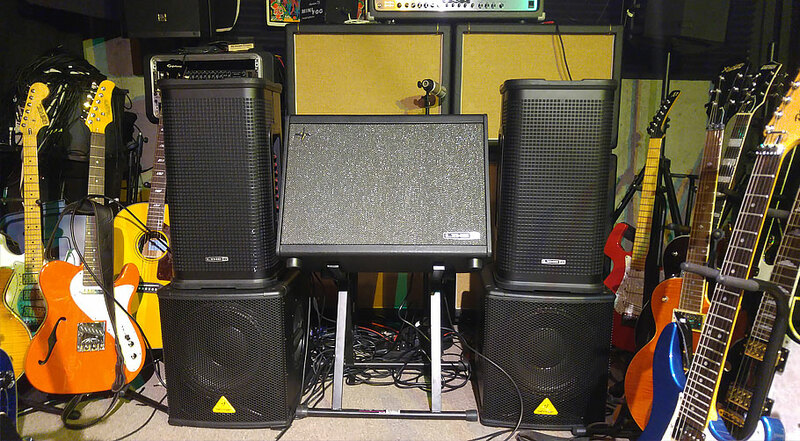 The L2ts are on poles over each subwoofer. I have the L2ts set at shoulder height, like my big rig. Along with the subwoofers this gives me the feel and the oomph that my big rig had. The 13 pin output from my ghost loaded guitars go to a Primova Sound GKPX-14 splitter with four outputs, mounted under the slanted pedalboard (my pedalboard is in two pieces, to make it easier to transport: the front board is flat and has all my guitar related stuff on it...the rear slanted pedalboard has all my synth related stuff). 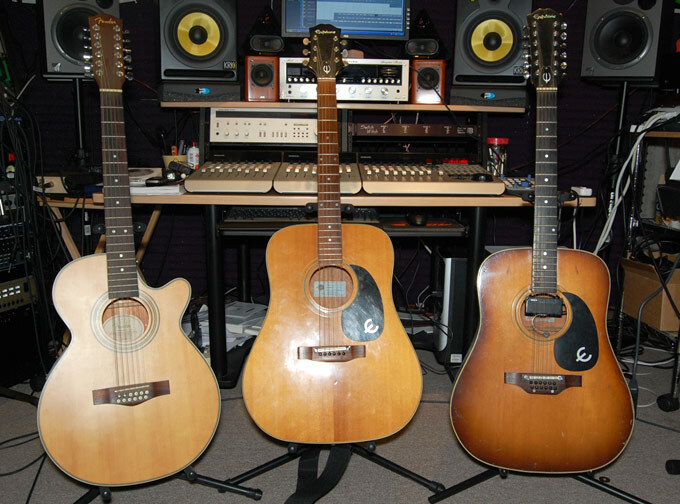 The first out goes to a Roland GP-10 (for acoustic , electric, 12 string, etc...Guitar simulation...kind of like a Variax guitar, without the guitar)-out of the GP-10 into an Electro-Harmonix 720 Stereo Looper, into an Eventide H9 Max (for reverbs, delays, etc.) and into a channel of the mixer. 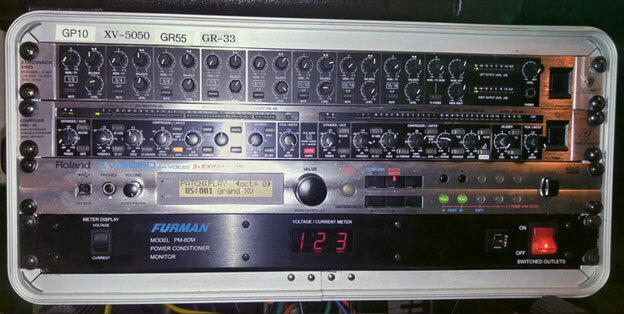 The other three GK cables go to two Roland GR-55 guitar synths and a Roland GR-33 guitar synth. All of the outputs go to a Behringer mixer and a Joemeek MC2 Stereo Compressor (both mounted under the slanted pedalboard). Also under the slanted pedalboard, I have a power strip, a hum eliminator and two Behringer stereo DI boxes. One stereo signal goes to the L2ts, the other goes to the stereo hum eliminator, which goes to the DAW (when recording) or the FOH (when playing live)...this way, I don't get any ground hum, when interfacing with another system. 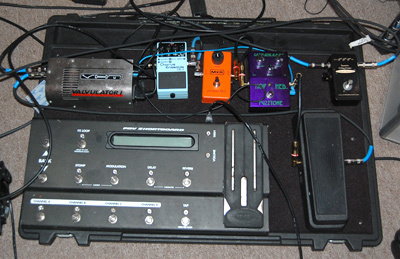 On the front flat board, I also have a TC Helicon VoiceLive2 for vocal duties. 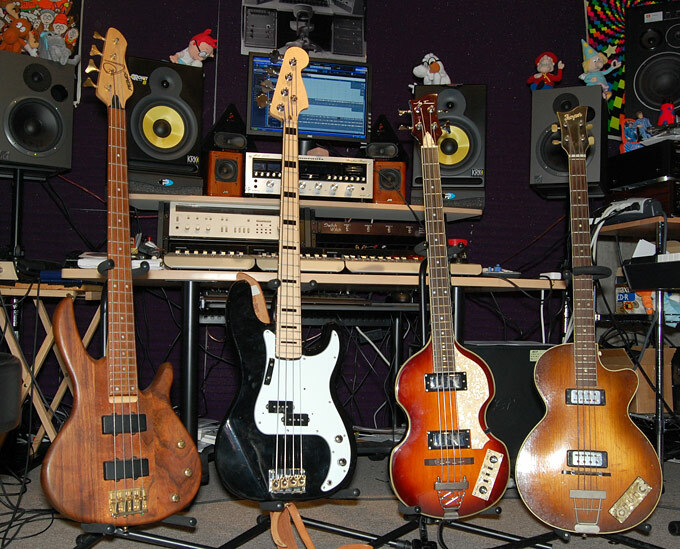 All of this allows me to recreate any of the overdubs (synths, strings, horns, piano, organ, acoustic or electric guitars, etc) that are on our recordings, in a live situation. 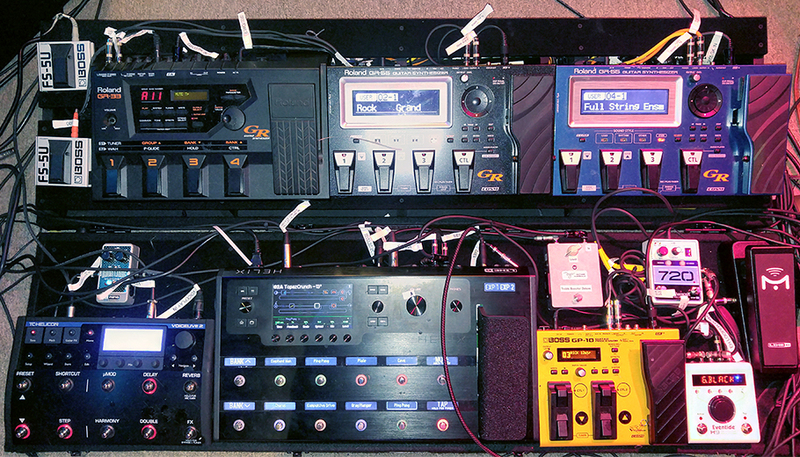 This new rig uses my old LYT pedalboard that I used with my Vetta rig, to reduce weight. 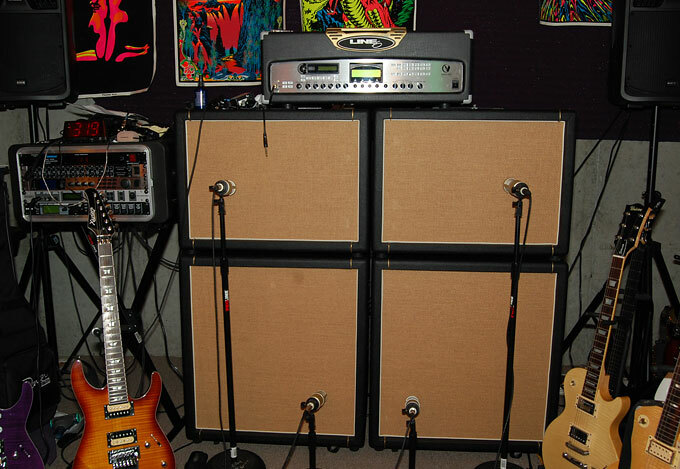 This new 2018 rig is, basically, the same as the 2016 rig (see above for signal flow), with the black Roland GR-55 being replaced by a rackmounted Roland XV5050 and the pedalboard mounted mixer and compressor being replaced by a rackmounted Behringer line mixer and compressor. I have a stereo direct box with phantom power blockers on the board for the Helix. The rack has the same hum eliminator and stereo direct boxes that I had on the 2016 board for the mixer and compressor. The MIDIMATE changes patches on the XV5050. The F6 is for hold and mod on the XV-5050. The other two F5 foot switches are for bank changes on the GR-33. The Helix is on it's own detachable piece of acrylic, so that I can take it off and put it in the backpack, when I want. I use two PR30 and two PR40 microphones from Heil Sound to mic my rig. 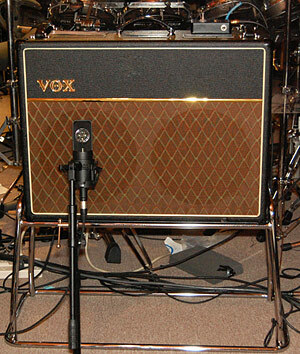 I also have another PR30 that I move around to mic various tube amps or Acoustic Guitars when I record. I can't say enough about these mics. 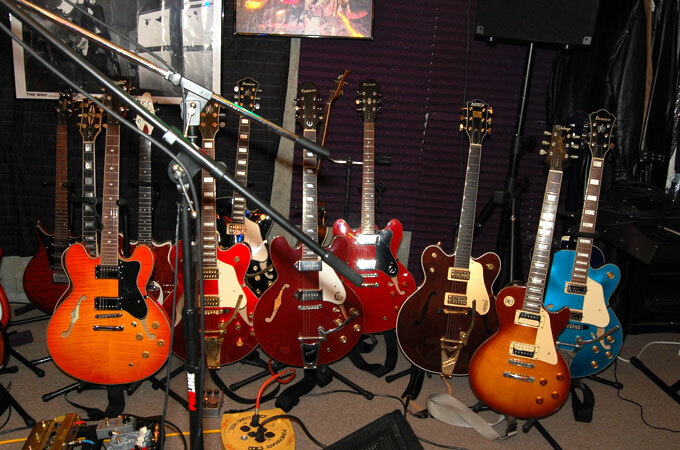 They have replaced my condenser and ribbon mics when I'm recording guitars. 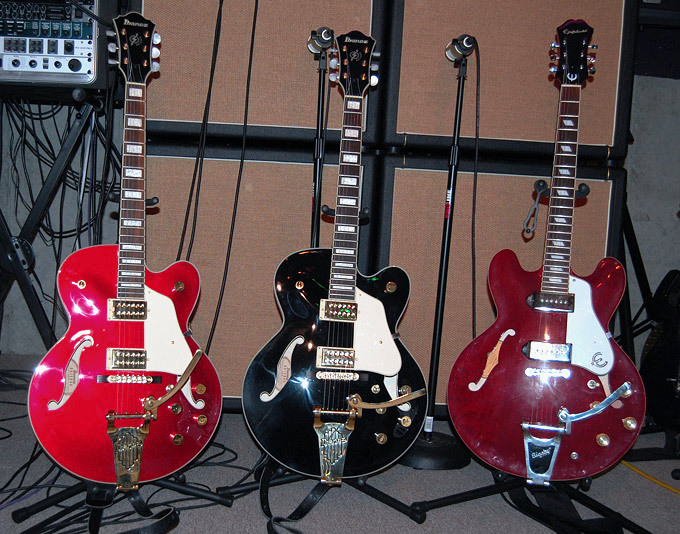 If you are a guitar player and you care about your sound, you need these mics. 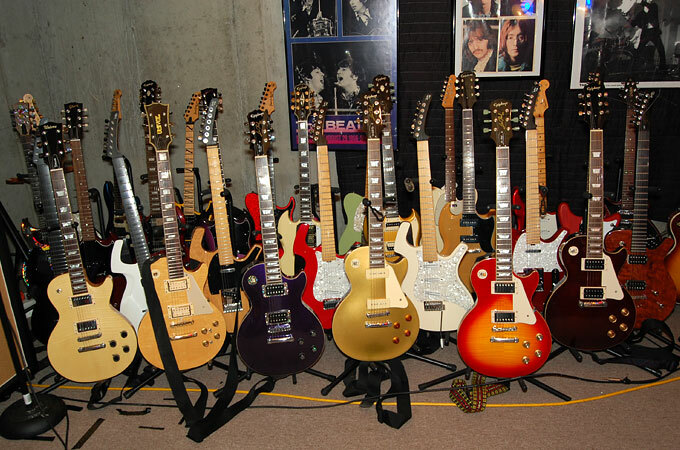 they require little, if any, EQ and they really reproduce the energy of your sound. All my triggers are by Pintech. I have eight toms, a kick and a snare. 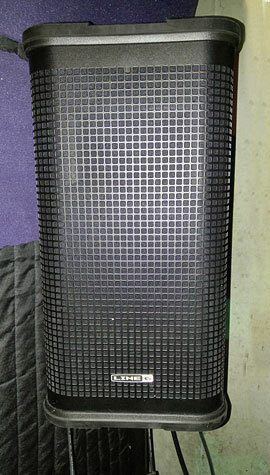 Three Pintech Concertcast pads (two 8" and one 10"). Everything else is a Sonor acoustic kit (except the Snare, which is a Pearl) converted to electric with Pintech triggers. 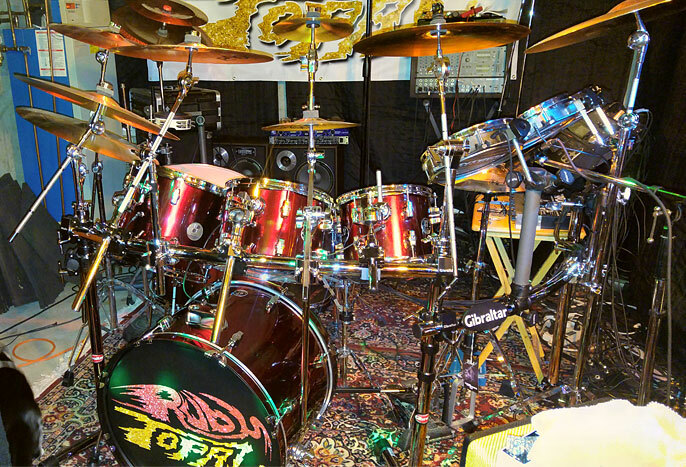 A 14" Snare, 22" Kick drum, 10", 12" and 13" rack toms and 14" and 16" floor toms. All these triggers go into a Roland TD-30 V-Drum module. When I record, I have usually used BFD-2 and BFD-3 Software in Cubase Pro 8, but lately I've been running lines from the TD-30 into Cubase - the V-Kick on one track, V-Snare on another, V-Toms L&R on two tracks and V-Overheads on two more. I don't use the V-Cymbals or the BFD Cymbals. 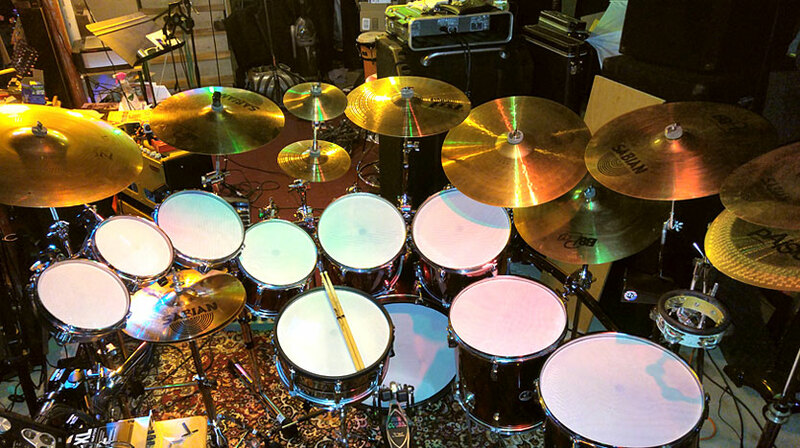 I use real cymbals - Sabian, Paiste and Zildjian. I take the V-Overheads and the real cymbals, subgroup to a channel called "overheads" and add some room or studio reverb (maybe a live room or studio from Altiverib or Waves Abbey Road Plates), so it sounds like the drums from the V-Overheads and the real cymbals were recorded in the same room. I don't have a giant studio with a great drum room, so this simulates it. Actually, it sounds pretty convincing. Overheads, in the past, have been JJ Audio modded C1 mics, JJ Audio U87 clone with vintage NOS transformer (made for a vintage U87) for the ride and an Audix F15 for hi hat. I have also used Cascade Vinjets, Shure Sm27s and have used dynamics like Audix i5s and Shure SM57s (Geoff Emmerich used AKG D19 dynamics on almost all of the Beatles records that he engineered) ... but now I am using Joly modded Rode NT5 small diaphragm condenser mics...l love them. They are detailed, without being harsh (like they were before the mod). They EQ nicely. I am still using the Audix F15 for the hi hat.
" 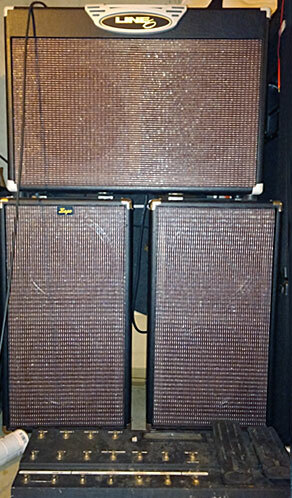 Spider Valve on top of a Peavey ValveKing 4x12 cab with Eminence Governors and Texas Heat. The ValveKing is being mic'd by a Heil PR30. This mic ROCKS!!! I also use two PR30s and Two PR40s to mic my main rig. 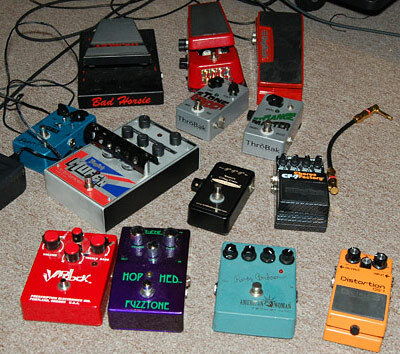 I use the Pedalboard with the Spider Valve. 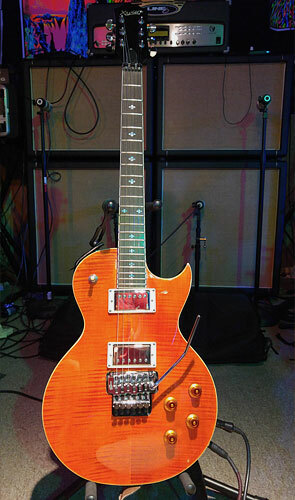 It has a line 6 Shortboard to control the Spider Valve, a VHT Valvulater, a Crispy Cream treble booster, a Crybaby with the Fasel inductor, a Hop Hed Fuzz (Sola Sound Tonebender clone), MXR Phase 90 and a CE 5 Chorus pedal."